Today’s most important thing in cooking seems to be ease of preparation, convenience of products/ingredients and simplicity in executing the recipe. Yet, wrapped within those parameters, the food must be amazingly tasty and fabulous! Those are pretty tough guidelines, but it can be done with some creativity! 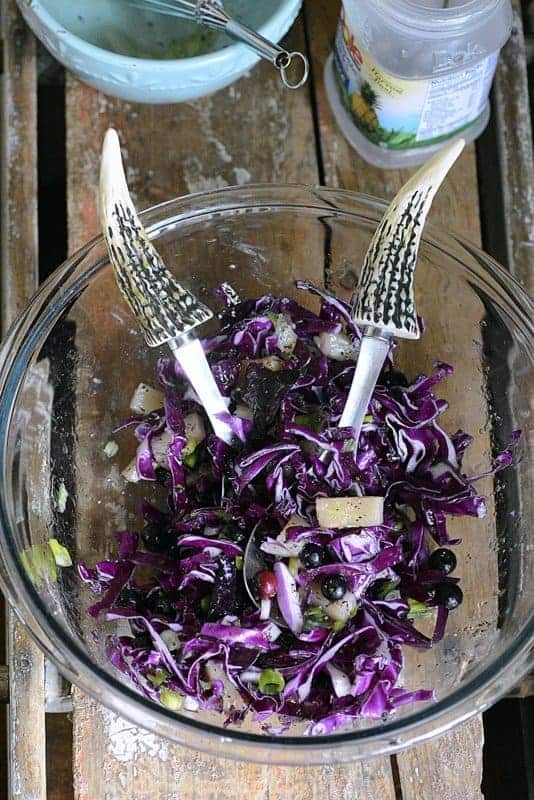 And, this crunchy pineapple blueberry slaw handles all these requirements hands down! Oh, yes, another thing that’s really important in today’s world is saving the earth and her resources as in recycling. Now, I’ve been doing this and was taught to do it from the time I was a little girl. Growing up in the hills of Appalachia in Southern West Virginia, we didn’t waste anything. Most everything our hands touched had a second and third use down to wrapping and bows from the holidays, empty jars and plastic tubs and even water. So, when I look at what I cook with today, products I purchase, I’m also considering how can I ‘re’use if I need to something about it. That’s super simple with Dole Sunshine products because they’re packed in BPA-free packaging and are totally recyclable after using. In the case of these pineapple chunks, you’ll see how I re-used the plastic container with the really great screw on lid for another occasion. 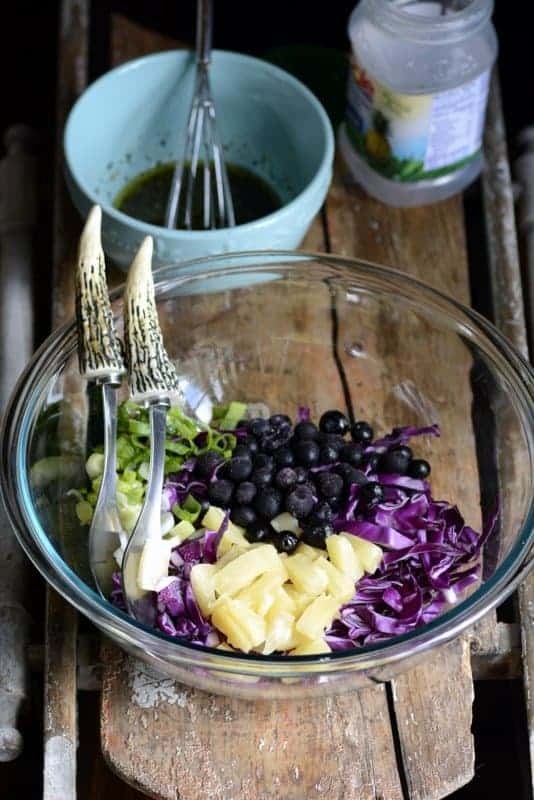 Combine in a large mixing bowl, the cabbage, green onions, pineapple tidbits, and blueberries. In a small bowl, whisk together the reserved pineapple juice, olive oil, lemon juice, Italian seasoning, salt, pepper and honey. Pour the ‘vinaigrette’ mixture on the slaw. This salad is easily portable for picnics, outdoor concerts and BBQs. 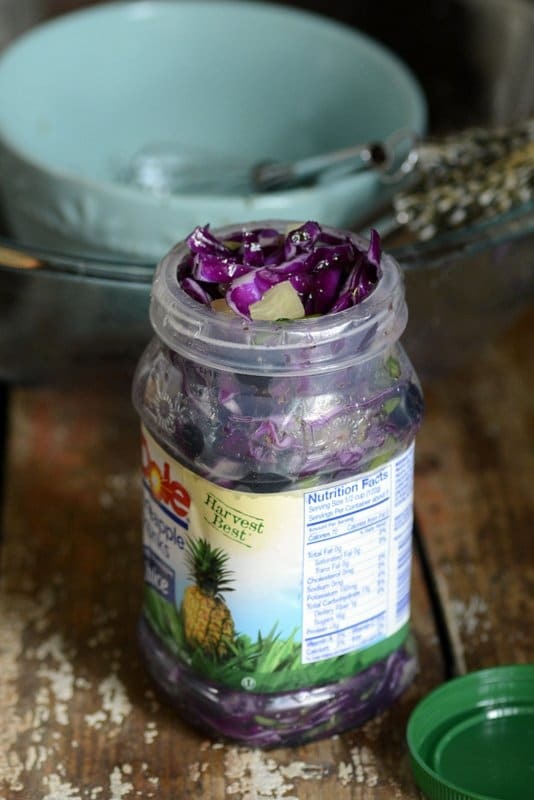 Just use empty clean Dole Sunshine plastic jars. Be sure to recycle and reuse your Dole Packaged Food plastic cups and jars. They're great for lots of things! This is one clever recipe, my friend!! Loving the colors and the flavors!! Can’t wait to make this one! Looks oh-so very good, my dear! Love all the colors and crunch… So fresh and delicious!!! I love the vibrant colors! The blueberries with the pineapple … YUM! Colorful and lots of flavor. This is so colorful and recycling to boot. That ticks all my boxes. We will be taking that along on beach picnics!! Pinned and Tweeted. Love crunchy slaw! your recipe is so colorful and flavor-filled! YUM! Oh my Ally! 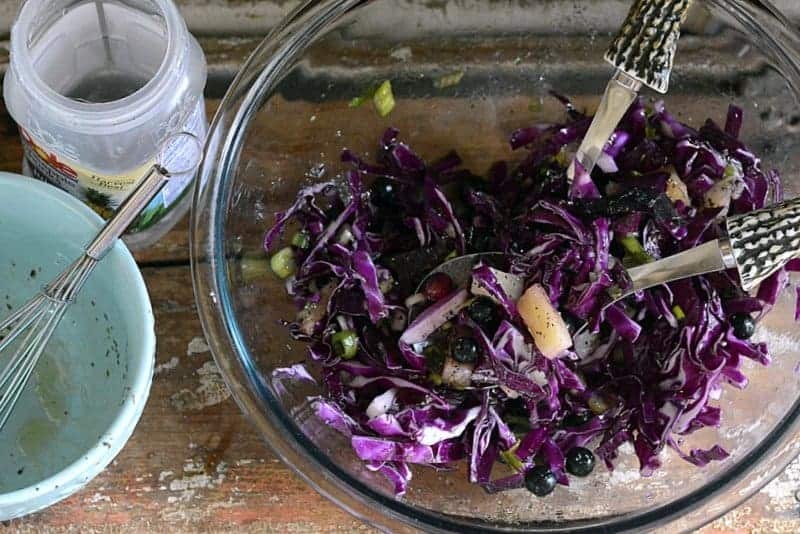 This slaw looks so fruity and delicious. I am totally going to make this. Oh my goodness, Ally… This looks incredible! I love the rich colors and bright flavors! Can’t wait to taste it! What a combination of flavors!!! I love it Ally Girl! You’ve created another hit, as usual! Wow! What a great idea! The only fruit I have ever tasted with cabbage is apples, but blueberries and pineapple… Dang this sounds delicious! Fabulous color too! ? I think that I am going to add this as the base to our favorite tacos. I love all of the yummy combinations! Ally, this looks and sounds so good! Loved your descriptive “crunch & squirts.” 🙂 Texture is as important as flavor, and you have a knack for creating both!